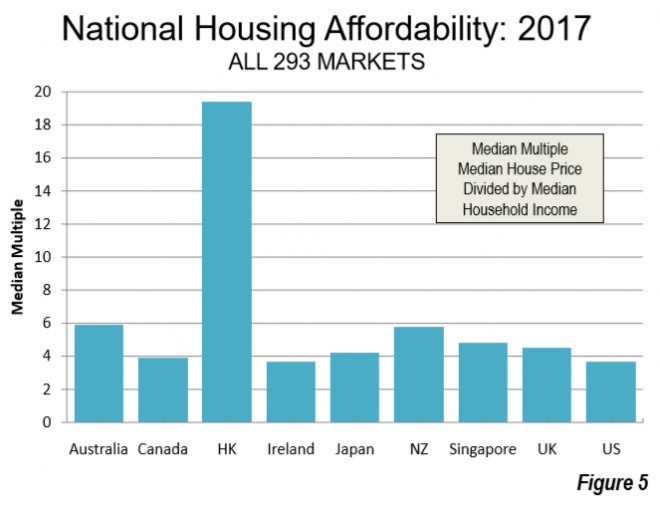 The 14th Annual Demographia International Housing Affordability Survey has been released and, once again, it ranks Australia as having one of the most expensive housing markets out of the countries surveyed. This year’s report assesses 293 urban markets in nine countries: Australia, Canada, Hong Kong, Ireland, Japan, New Zealand, Singapore, United Kingdom, and the United States as at the third quarter of 2017. The survey employs the “Median Multiple” (median house price divided by gross annual median household income) to rate housing affordability. This measure is widely used for evaluating urban markets, and has been recommended by, amongst others, the World Bank and the United Nations, and is used by the Harvard University Joint Center on Housing. The Survey ranks urban housing markets into four categories based on their Median Multiple, from “Affordable” (3.0 or less) to “Severely Unaffordable” (5.1 & Over) [Table ES-1]. Average multiple data (average house price divided by average household income) is used in Japan, since data for estimating medians is not readily available. 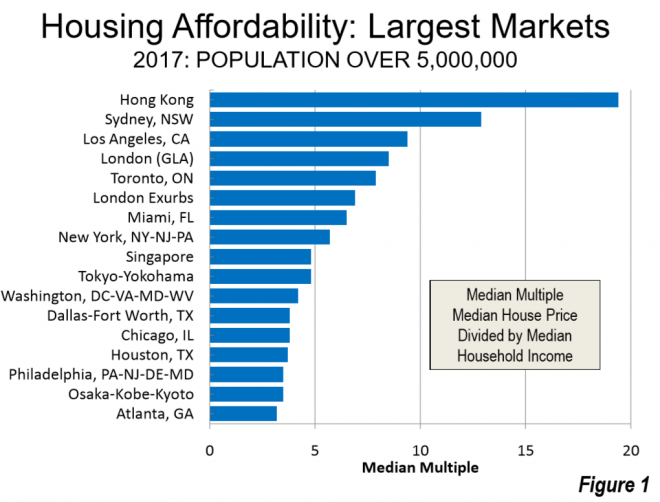 According to the Survey, housing affordability remained poor across most major metropolitan markets in 2017 (i.e. with over 1 million people). 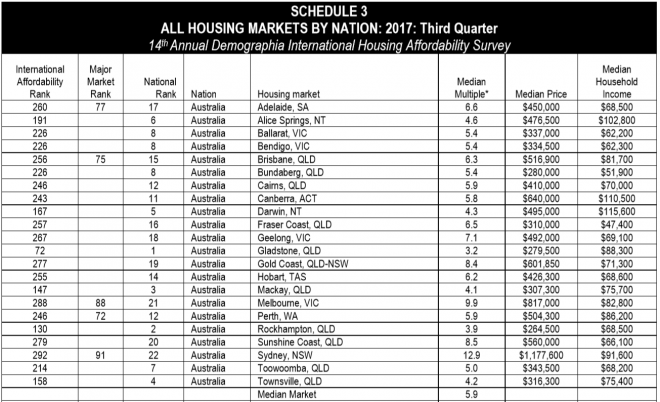 As shown in the above table, all but two of Australia’s 22 markets captured in the survey are ranked as either “Seriously Unaffordable” (5) or “Severely Unaffordable” (15). 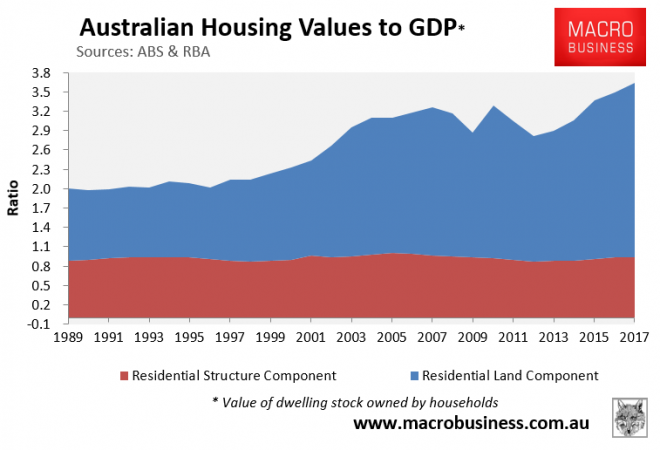 The overall decline of housing affordability in Australia over the past few decades is also clearly evident in the above Demographia chart. 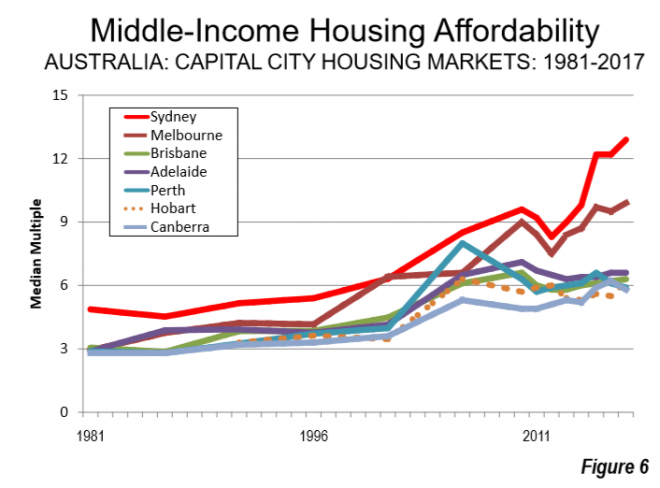 Whereas all major Australian markets, except Sydney, had Median Multiples of three in the early 1980s, today all are ranked at around five or above (well above in the case of Sydney and Melbourne). Historically, the Median Multiple has been remarkably similar among six surveyed nations, with median house prices from 2.0 to 3.0 times median household incomes (Australia, Canada, Ireland, New Zealand, the United Kingdom and the United States). 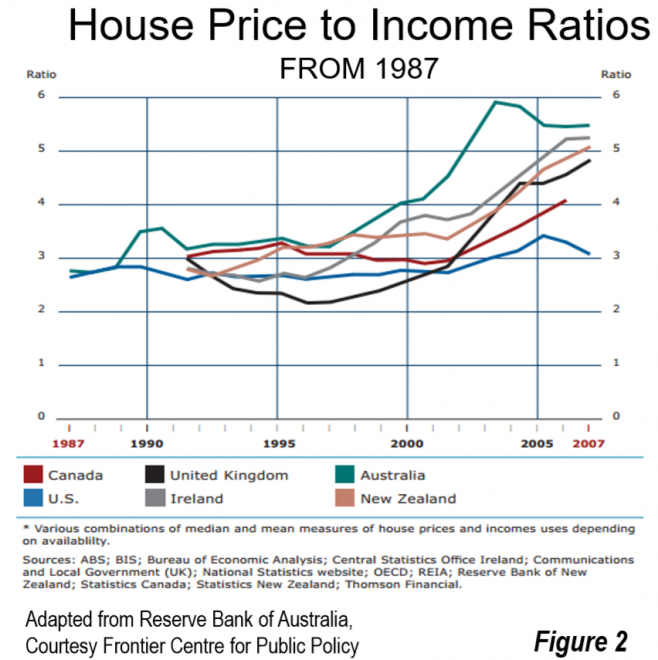 Housing affordability remained generally within this range until the late 1980s or late 1990s in each of these nations (Figure 2). In recent decades, house prices have escalated far above household incomes in many parts of the world. The key to both housing affordability and an affordable standard of living is a competitive market that produces housing (including the cost of associated land) at production costs, including competitive profit margins. …virtually all the severely unaffordable major housing markets covered in the Demographia International Housing Affordability Survey have restrictive land use regulation, overwhelmingly urban containment. 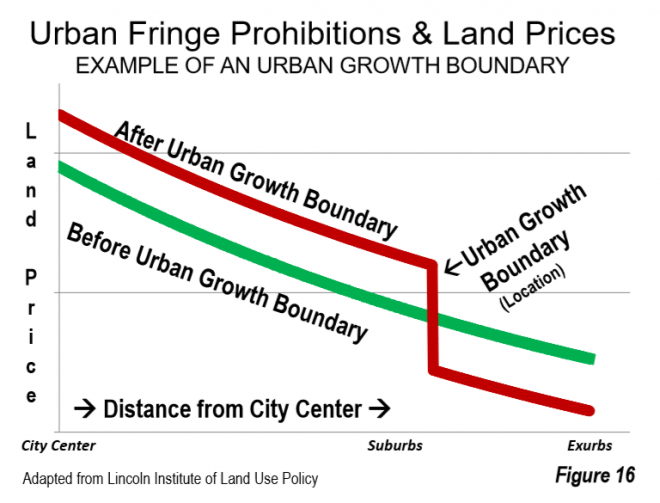 A typical strategy for limiting or prohibiting new housing on the urban fringe an “urban growth boundary,” (UGB) which leads to (and is intended to lead to) an abrupt gap in land values (Figure 16). There is an emerging understanding that more housing supply is required to address housing affordability. However, in urban containment metropolitan areas, interest in new supply has been largely limited to higher density infill, while leaving the urban periphery restrictions in place (Section 3.9). This seriously diminishes the potential for improving housing affordability, because the lowest land prices are on the urban periphery and because there is substantial demand for the larger housing, preferred by families, that can only be economically built there. 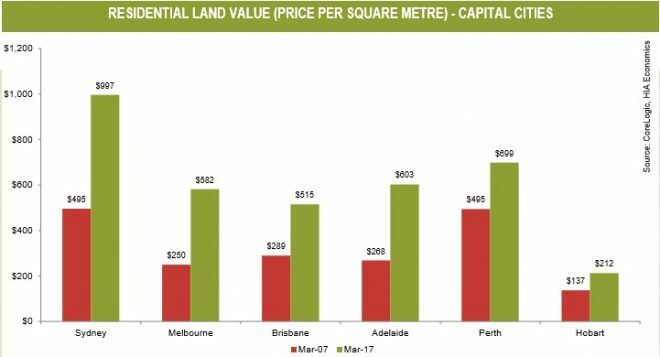 Unless urban fringe restrictions are relaxed enough to restore the competitive market for land, improved housing affordability is unlikely (Figure 15, above). More Restrictive Land Use Regulation uses urban containment policy or other mechanisms (such as comprehensive plans or development limits) to such an extent that the competitive market for land is not permitted to operate on the urban fringe. More restrictive land use regulation seeks to outlaw the liberal regulation that produced middle-income housing affordability. By severely limiting or even prohibiting development on the urban fringe, urban containment eliminates the “supply vent” of urban fringe development, by not allowing the supply of housing to keep up with demand, except at prices elevated well above historic norms. Liberal Land Use Policy (Less Restrictive Markets) applies in markets not classified as having more restrictive land use regulation (where competitive land markets are permitted to operate on the urban fringe). In these markets, residential development is allowed to occur based upon consumer preferences, subject to basic environmental regulation. Generally, liberal land use regulation is “demanddriven” Land is allowed to be developed, except in limited areas, such as parks and environmentally sensitive areas. 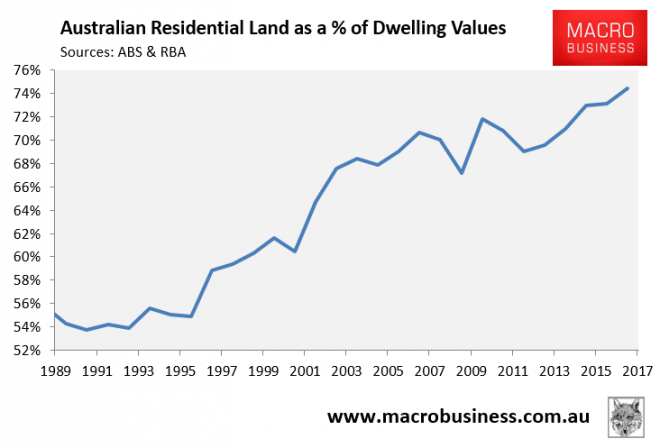 By allowing development on the urban fringe, liberal land use regulation allows the “supply vent” to operate, which keeps house prices affordable. Less restrictive regulation can also be called traditional or liberal regulation. In addition to lower housing costs relative to incomes, the lower population densities typical of liberal markets are associated with less intense traffic congestion and shorter average work trip journey times. Liberal land use regulation has also been called “traditional” regulation. So, under an open market-based model (provided there are not also substantial physical barriers to housing supply), increased demand, such as from reduced lending standards and easier availability of credit, quickly leads to the building of additional low priced housing on the urban fringe, which helps keep house prices in check and reduces the likelihood of speculative housing bubbles developing. 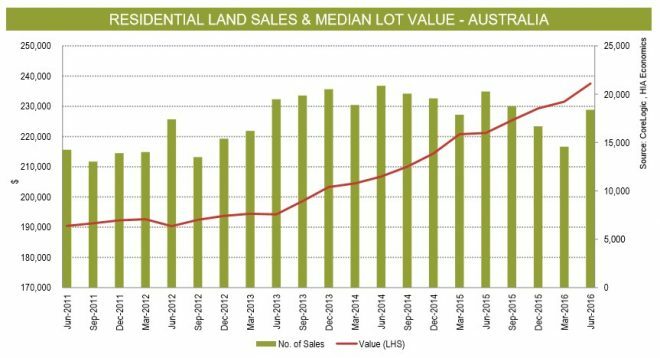 Further, highly leveraged speculators are less likely to be encouraged into open land markets, since there is little prospect of achieving strong capital gains. Investing in open land markets is, instead, more about rental yield. I will add that restrictive urban planning structures should not be viewed as a one-way bet for house prices, with unresponsive land supply also more likely to result in higher levels of house price volatility and boom/bust price cycles – a fact also acknowledged by Demographia and evident in Ireland’s boom and bust. Why? Because strict land-use policies (planning) steepens the supply curve, which makes house prices more sensitive to changes in demand, increasing the likelihood of the housing market experiencing boom/bust price cycles as demand rises/falls. The full 2018 Demographia Housing Affordability Survey can be downloaded here. A pathological dependence on private bank money creation sprayed with great tax policy driven intensity at a specific existing asset class. To the extent that there has been some tweaking of the settings (Hi-rise skybox petrol clad human BBQs and Macroprudential) neither is allowed to put the bubble under any real pressure. it doesn’t. It may help keep “price to the moon” psychology a bit controlled but it doesn’t do more than that. Market (supply/demand curve) forces do not work on natural monopolies such is land. Examples from the past are telling us the same, almost every housing bubble was accompanied with building boom and crashed only when demand side crashed (easy money availability). Even in Texas (the most “open market-based model”), out-of-trend price growth in 80s ended because demand crashed (Savings and loan crisis) not because free supply met demand. Without “open market-based model” prices would maybe go even further up before they crashed but that’s only marginal. As someone who witnessed it first hand, psychology at the time was crazy and pure bubble madness not much different than early 2000s madness in California (also witnessed first hand). I have to be fair and say that none of these madness’s are not nearly as mad as the current Australian one. Would be interesting to see opinion of someone who experienced Irish madness but I have a feeling we are off the chart. Yep the supply argument has always been fallacious. If investors wake up one Saturday and decide they are happy with half the yield they were happy with the previous week (say because CG expectations take-off due to mass hysteria) is it really credible to imagine you can have an equal and offsetting and immediate response in supply? No, because supply isn’t supposed to and can’t respond to changes in the asset price. In equilibrium the asset price adjusts purely to ensure the total return on housing as an asset offers the same total return as all other assets. Outside equilibrium it goes on a self reinforcing speculative spiral. It is supposed to and can respond to the consumer price of housing (market rent) – and has done if you measure housing affordability correctly. this counter argument has been made a few times at least, but still the shortage argument seems popular for some reason. Despite all evidence; for example the sequencing in bubbles always starts on the demand side. ie. housing gets financialised, the speculative ball starts rolling, supply responds but to no avail. Most bubble markets have had hyper development and over-zoning during the bubble phase and it was never the catalyst for the bust. The catalyst was always a collapse in speculative demand. Completely the reverse of the shortage story, which says the supply curve shifts or steepens first. In reality a *bubble* market may be able to be shown with an upward sloping demand curve, and an upward sloping supply curve which is surprisingly flat. More qty supplied meets more qty demanded and higher prices – meaning dampening speculative demand is the only solution to the bubble. I am not a fan of picking the one true cause (supply v demand)- that is a pretty arid debate – plus no surprise that I have plenty of sympathies for the demand siders. Well that is something quite substantial. It is a harder to keep the animal spirits pumping and the demand for credit strong if farm land can be readily converted to low cost subdivisions. And hard to spin the necessary narratives. And that is an important and often over looked issue. The costs of converting land use is as important as to whether you can do it at all. In theory there may be a great willingness to rezone farmland for suburbia but if the taxes and charges associated with it reflects a desire to milk easy credit mortgages as a revenue earner, the cost of doing so may kill demand. Add in large immigration programs and you have created an perfect environment for out of control private bank credit creation. Always nice to hear Sweeper holding forth on that subject … even if his pudding has too much egg as per usual. How would you prefer the pudding? Flippant “both sides have merits” well padded Gittins style narratives which lead to nowhere, mixed in with casual accusations that the other person is a “developer apologist”? I think that would be an inadequate way of looking in to the topic 007. And I admit my attempt is lacking. Because it is a confusing topic. There is barely any agreement on how to model housing as an investment asset especially in a bubble market. But the ‘beef in Cuba’ story of the Shortage team doesn’t pass a prelim theory and evidence check. You sound like Skippy a bit more every day. Not sure what point you were trying to make but it sounded a bit like you find non binary options too complicated. You seem to end up where you started. It is all about the excessive private banker created credit. I suppose I should encourage you for making further progress in that direction. I understand LA Tingle is talking about the 1937 Royal Commission with Uncle Phil on late night live tonight. Radio National. Seems to be a topic of some growing interest beyond “money crank” circles. Your crystal radio might be able to pick up the transmission if you fiddle with the coat hanger a bit. I hear that ScoMo is going on a fact finding mission to Hong Kong. That would be too close and cheap. Paris perhaps? HE or H&H you might want to cast your eyes over this. It’s the Vic Government Soliticor General’s Report over the cladding fiasco. Long story short: it shows how much of a clusterfk the potential liability is. Friday’s decision was just the beginning. Isn’t Demographia a front for land developers who want to destroy our city farms? Evil sh1t if you ask me. Established housing is best or if you are that type of person who likes new things then apartments are the way to go, and they’re doing very well everywhere! That Kouk is a ledgend and is always on the money so I agree with him. The methodology of the report neglects things like our great weather and top notch beach vibrancy!! Our houses are also bigger, better quality, and have great views. The report compares apples with rocks. focusing on land use restrictions still begs the question of why that land even needs to be ‘used’ in the first place. it would not if there was no population growth. Alice springs has a median income of $100K?!? If there is a problem on the supply side, how come rents have not ballooned? The only real measure of an actual housing shortage is when rents rise. Not everyone needs to buy but everyone needs to at least rent. The last few decades have seen an epic rise in rents. For example in Sydney, an ordinary house that once rented for 1/3 an ordinary income, now rents for 1/2 an ordinary income. This is a 50% increase in one of life’s greatest expenses. For example, in 1985 a typical school teacher would have easily rented (or bought) a 3 bedroom house with yard an easy commute from their school. It was quite normal for teacher to live in the same suburb as their school. If the teacher was male, the wife need not work to pay the bills, although in 1985 plenty of women were working. Now the teacher and his wife both need to work, and it is quite common to hear of 40min, 60min or longer commutes being made by teachers. The only real measure of an actual housing shortage is when rents rise. Track the rent for any given house over a 30-40 year timeframe. Alternatively track the size and location that say 25% of a wage gets you. Both statistics show the epic rise in rents and epic crash in affordability caused by the extremely serious housing shortage (Sydney). Note: Shortage-deniers have various tricks up their sleeve. One of their favourites is finding that rents have fallen somewhere over the last few months. Perhaps you could find such a statistic? Another trick is claiming that renters still tend to pay around 30% of wage on rent and this hasn’t changed much over the decades. This deception works if you ignore quality. As if a dogbox 1hr commute from work is the same as a house with yard 20 minutes from work. How come Japan is so expensive? They’ve got a shrinking population so it can’t be unmet supply for people to live in. It’s not really that expensive at all, at least by Australian standards. The Demographia report only looks at Tokyo and Kyoto as well, both of which have more than 10 million residents. That’s Hong Kong style population density with a price to income ratio about the same as Mackay. Mind you the median “house” in Tokyo or Kyoto is a very different thing to the average house in Australia so I’m not sure it’s really apples with apples. Be interesting to know how it works out on a price per square metre basis. The FT ran a story last week about how a fifth of Japan’s territory is “unusable” due to feudal laws and untraceable owners. I’m guessing that much of that unusable land would be out in the sticks rather in the urban areas (can’t crack the FT paywall, the buggers must have tightened up their defences (??)). Also for a country that is stripping massive areas of forest in other countries for paper and chipboard production Japan has been extremely protective of its forests, which cover about 67% of its landmass. If you add just those two percentages together (assuming no intersection) that leaves bugger all space for the 127 million Japanese to live and work other than in densely populated urban areas.